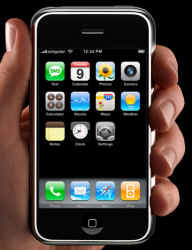 The Apple iPhone has been a tremendous success in revitalizing the smartphone concept (www.apple.com/iphone). The iPhone (and its companion iPod touch without the phone features) provides a much more integrated and pleasing experience that combines phone, PDA, and Web usage with Wi-Fi wireless networking -- plus the full iPod player experience (syncing content with iTunes). At first look, the iPhone has an impressive 3.5 inch widescreen touch display, at 480x320 resolution, with battery life rated at up to 24 hours for audio and up to 7 hours for video. And the design is attractive: The front of the iPhone is all display, with just one power/menu button, filling out the hand-held form factor at under 4 1/2 x 2 1/2 x 1/2 inches, and under 5 ounces. Plus, the price has dropped (complete with a rare Steve Jobs mea culpa) from the original $599 to $399 with 8 GB. To use the iPhone as a media player, of course, you just synch it with Apple's iTunes software on any Mac or PC, like any other iPod -- including music, podcasts, photos, and video. For Internet use, the iPhone aims for the best of both communications worlds -- fast Wi-Fi connectivity when available, or otherwise falling back on the mobile network. But the current iPhone uses the relatively slow AT&T (Cingular) EDGE mobile data network, with average data speeds between 75 to 135 kbps (www.wireless.att.com). The iPhone connects immediately over Wi-Fi to surf quickly in public sites like hotels and coffee houses (even with other near-by networks), and can keep downloading when you go out of range, as it quietly switches over to the cellular network. And with the opening of the Apple App Store, iPhone users can add additional applications including games, business, news, sports, health, reference, and travel (www.apple.com/iphone/appstore). The iPhone interface has that Apple strength of design -- friendly and appealing, and also implemented in a way that is consistent and responsive. The functions fit together well, and work in similar ways. For example, when you tip the iPhone on its side for a wider view, most (but not all) the applications automatically switch from portrait to landscape orientation. Plus there's the cool gesture of pinching your fingers together which can be used to zoom in on websites, photos, maps, and in other contexts. The user interface is smooth and delightful, with gentle animations that provide visual transitions from one activity to the next. When you shoot a picture, for example, you see a camera iris close and then reopen -- the animation confirms that you've taken the shot (and also cleverly masks the delay while the photo is shot and stored). And the touch-screen interface is even better -- just flick your finger to scroll, faster or slower. As you scroll, a very subtle scroll bar appears along the side to give you some sense of the context (where you are relative to the full size of the document). Even better, the scrolling motion actually bounces at the end of document, as a physical indication that you've hit the end of the scroll region. The downside of this interface design, however, also is its simplicity. There's no room to provide additional options that might be helpful for more advanced users, or even context about what you are looking at. For example, without scroll bars as part of the standard interface, you can't tell whether you are looking at an entire document / photo / Web page, or whether there is more information hidden off-screen. The simplicity of the iPhone interface also is a disadvantage when you try to use it for serious business -- for example, using it as an organizer to store multiple thousands of contacts and calendar entries -- that cool finger-flick to scroll becomes a lot less fun as you wade though thousands of entries. The original iPhone, introduced in mid-2007, enthralled its fans, but was a tad pricy at $499 for 4 GB of storage (with no expansion card slot) and $599 for 8 GB. This was reduced a couple months later to an 8 GB model for $399, followed in early 2008 with a 16 GB model for $499. The iPhone 3G, introduced in mid-2008, upped the Internet access speed with 3G networking, added GPS tracking, and picked up the iPhone 2.0 software, especially with access to the Apple App Store for downloaded applications. The price dropped to $299 for 16 GB and $199 for 8 GB. 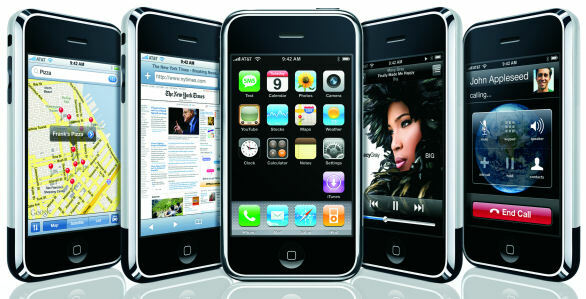 A year later, in mid-2009, saw the introduction of the iPhone 3G S, which runs up to twice as fast, and added several obvious features found in competitive products, including a 3 megapixel camera with autofocus (was 2 MP), video recording (was photos only), and hands free voice control (as in mobile phones). Apple also released the iPhone OS 3.0 software, again with much-requested features including cut & paste (finally), MMS multimedia messaging, Spotlight Search, landscape keyboard, and a Find My iPhone feature for lost phones (via MobileMe) with a Remote Wipe self-destruct option. AT&T (Cingular) is exclusive iPhone carrier partner in the U.S.